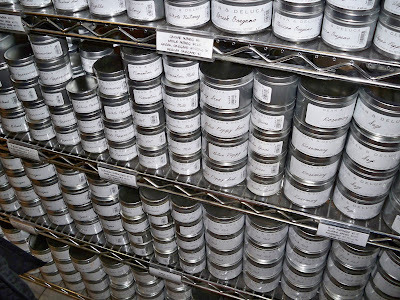 Her Rhode Island pantry is legendary, stocking more than 240 items. When you meet her, she is warm, generous, direct, at times uncompromising, and always keenly insightful. With all that going on, one’s inevitable first question feels a bit like a cliché – Why is food blogger Lydia Walshin so preoccupied with her Perfect Pantry? It began when she and her husband Ted moved to a cozy log cabin in Rhode Island. Managing the kitchen space was essential. “I wanted not to have shelves full of things I didn’t use,” she tells me. Indeed, an item is only eligible for Perfect Pantry status if it meets three criteria – 1) The ingredient must be used in other recipes; 2) It must be something used in more than one way; 3) It is used in only one way, but over and over again. “I won’t buy it because it’s in a beautiful bottle or because it’s in one recipe,” she states categorically. On the surface, that can sound a little like a “how-to” tip from a home keeping handbook. But, spend a few hours with Lydia and you soon learn that the Perfect Pantry is actually a metaphor for a well-seasoned life – filled with discovery, diverse experiences and relationships – where community thrives at the center. 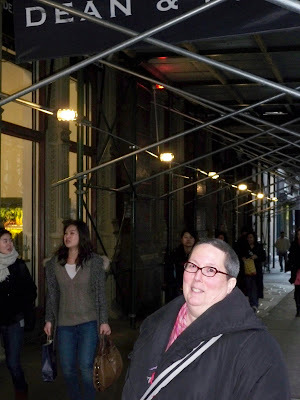 We alight from our taxi in front of Dean & Deluca on Broadway in Soho. Lydia has travelled to New York and done me an enormous favor. In return, I’ve promised an afternoon of culinary play, along with a gourmet foraging expedition. If Lydia can find one or two pantry items at Dean & Deluca that she currently does not stock, I’ll pick up the tab. We walk the gleaming, spacious aisles of the gourmet market and Lydia scrutinizes the ingredients that line the shelves. “Nope…Already tried that…Not that one…” she murmurs quietly. She notices a package of plump, russet-colored grains labeled Kamut, which look like a cross between rice and orzo pasta. It makes the cut, and she drops the package into her canvas Ninecooks tote bag. We pass a massive display stocked with spice tins. A gleaming pewter-colored canister catches her eye. The words Grains de Paradise are printed in fancy script on the label. 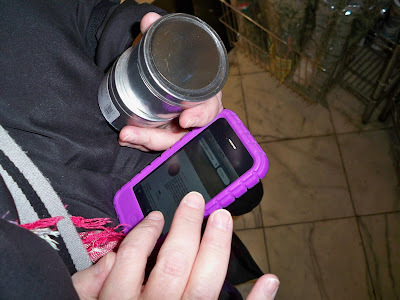 Lydia shakes the canister with curiosity, pulls out an I-Phone in a hot pink case and types some search terms into Google. She locates a lead on Gourmet Sleuth. Grains de Paradise was once used as a cheaper substitute for black pepper. The exotic name was invented by medieval spice traders in an effort to inflate the price. “I’m not making this up,” she insists. Perhaps it is the compelling name, or the age-old connection to hucksterism but Grains de Paradise, too, is selected for consideration in the Perfect Pantry. “I want the can,” says Lydia admiringly. 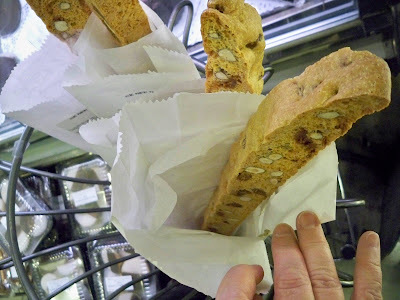 We encounter the world’s longest biscotti and partake in a little layer-cake envy in the bakery department. “Your cakes are just as good,” she tells me. Lydia began writing professionally at the age of 16, but it was some time before she took on the topic of food full-time. She is far from the detached reporter and her capable hands often find their way into the story. “I only do two things in life really well – I write and I organize,” she explains. In 1995 Lydia published “South End Cooks: Recipes from a Boston Neighborhood.” The book is a microcosm of her Boston community conveyed through the personal stories and recipes of 80 cooks in home kitchens, restaurants and local agencies across the South End. The menu of voices and recipes is as varied as the neighborhood – two generations of Chinese cooks, a restaurateur from Ethiopia, or a Jesuit priest serving special dinners to people with HIV/AIDS and their caregivers. Proceeds from the sale went to three local community agencies. Lydia joined the food blogging world in June 2006 and immediately embraced the community. She reveled in the opportunity to write her own material without the filter of an editor. It was intended as a one-year project. From the outset, the Perfect Pantry offered more than her voice on the subject of food and ingredients. There were Bookworms, Guest Bloggers and Other People’s Pantries supplementing Lydia’s thorough research and engaging copy. 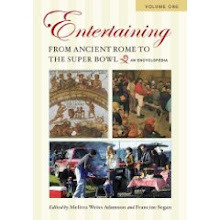 Lydia frequently offers anecdotes of her husband, her friend Peter and her extended family. She talks of creating links to food bloggers whose writing she enjoys, in an effort to support their work. There is a hint of excitement in her voice as she describes two bloggers connecting through the comments section on her own blog. She hopes that visitors find a welcoming place at the Perfect Pantry, and that the voice they hear is one of kindness. These days much of her energy is devoted to Drop In & Decorate – Cookies for Donation, a project she created that has now become a not-for-profit organization. Friends gather to bake and decorate cookies. The activity is social, and the homemade results are donated to a local shelter or food pantry. Hundreds of batches of whimsical cookies have been baked and decorated for the community since Drop In & Decorate was first conceived and the enthusiasm continues to spread. There have been at least 30 Drop In & Decorate parties held in 15 states, with two in Germany and one in India. It all wraps up into quite a delicious package. “Ninecooks is my defining brand, Drop In & Decorate is my passion, and the Perfect Pantry is home to the most fun and creative writing I’ve done in years,” says Lydia. I have the distinct impression that the world is Lydia Walshin’s Perfect Pantry, well-stocked with robust ingredients, creative cooks, kindness, hope and promise. 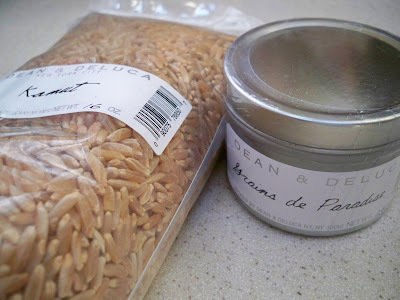 And what about the complete story behind new pantry items Kamut and Grains de Paradise? Stay tuned to Lydia’s Perfect Pantry for the answer! Lucky you, meeting Lydia in person! This is such a wide-ranging and intimate portrayal of someone who is truly a leading and 'mothering' force in the food blog community. Lovely! I'll go pantry shopping with you any time, anywhere! (In fact, I'm making a list for my next NYC visit....) Thank you for this lovely, lovely post; I'm grinning from ear to ear. Now to fire up my iPhone and get some ideas for how to use grains of paradise and kamut. I am up to the challenge, and looking forward to adding these two new ingredients to my pantry. What a savory and evocative write-up about one of my favorite food bloggers. It makes me envious of your meeting- I know Lydia only through her writing and photography. I can only hope I'll get lucky and browse a spice aisle with her someday. I hope so! Great post. I have not seen a better description of my wife than this post. Congratulation, Tom, you have captured the essence of Lydia. What a lovely sketch about Lydia. I feel very lucky to have been able to Meet her and become friends. We've had great times together, first at BlogHer in San Francisco last summer, where I also met Ted, and then in October when I got to visit them both in Boston and Rhode Island. The actual perfect pantry is a wonderful place to cook and the Rhode Island house is completely charming, just like Lydia. What a fantastic profile of a lovely, lovely person. Thanks for filling in more background about Lydia. Her site and voice is a treasure, and this is such an engaging interview. Well done! Thank you for a wonderful introduction to Lydia! A meaningful life, made even more special by first reading about her on MLK Day - and the day before the inauguration. You have described Lydia perfectly. She is a warm, generous person with a huge heart. We have been friends since we met here in Rhode Island after she wrote about my culinary tour.....Go Lydia.. This is a lovely profile on an even lovelier and insightful person. It has been a pleasure getting to know Lydia over the past thirteen months, and share thoughts and experiences neither one of us could have anticipated. I'm grateful that our shared love of writing, food and blogging has brought such a dear mentor and friend into my life. 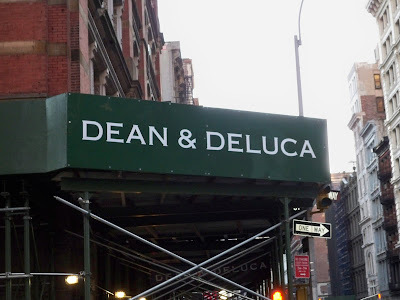 Way to tear up Dean & Deluca---that is one shopping trip I would have embraced! Oh, I am envious you met Lydia! And what a place to go ...Dean and Deluca. Fenugreek is used extensively in Persian cuisine to make one of their most popular dishes - ghorme sabzi. Lydia has an amazing ability to bring out the best in people! I have learned so much about the value of community from her. Thanks for a wonderful post! What a great portrait you have painted. I was delighted to meet Lydia at BlogHer and I think you have captured her essence. Lydia talked with anticipation about your upcoming adventure and it looks like you had a blast. We first met on the telephone when she called me blind to interview me for an upcoming article on perwonal chefs. We just hit it off. And we must have talked for at least 3 hours non-stop. I felt like I'd known her for years - like one of those friends with whom you can pick up where you left off even with years separating you. She is so involved in so many things but is always available to help or just to listen. And she is a goldmine of information. 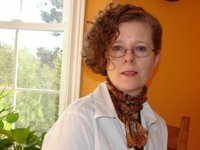 I was so thrilled when she invited me to guest blog on The Perfect Pantry and have enjoyed every minute. I can't wait to expose her to so many new ingredients when she and Ted come to Brazil!! !Thanks TW for your great tribute to our dear friend!!! rYour well-written piece is a beautiful description of my friend and neighbor Lydia. Check out Tony Hill's Contemporary Encyclopedia of Herbs and Spices for recipes for grains of paradise. Thanks for giving us a peek at the lady behind The Perfect Pantry. It sounds like y'all had a great time! I enjoyed reading this post. I have been following her blog for a long time and love it. What fun to tag along with you and Lydia. While I've only just met Lydia, it seems to me you've perfectly captured her warmth, generosity, down-to-earth practicality and deep committment to community. Thanks for letting us join you. Thanks everyone for commenting - what wonderful accolades for Lydia, and such a tribute to the person she is. And, thank you, Ted - high praise indeed! Happy New Year and Cheers – I’ll Take Manhattan!